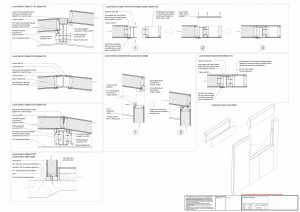 Some examples of my technical fabrication drawings for Structural Insulated Panel (SIPs) buildings, including steel fabrication, are included below. 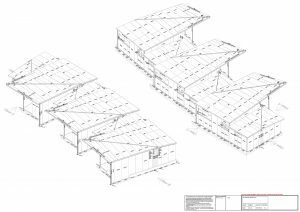 These drawings are used to manufacture all of the different structural components off-site. 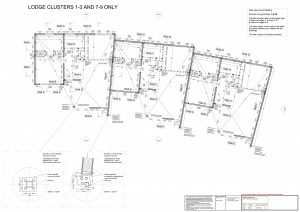 Once the componenets are delivered to site the drawings also show how they go together. They have to be millimeter perfect to ensure that the build is efficient and runs smoothly. Please click on a thumbnail below to open the full .pdf document. 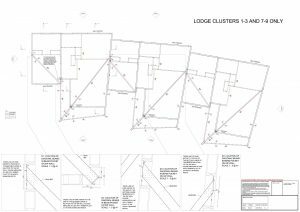 A drawing of a fully detailed computer 3D model of a hotel lodge project. The model resolves all structural detailing and the interfaces between the different structural elements. 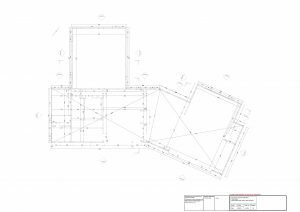 A 2D setting out drawing taken from the master 3D model showing SIPs and column base plate locations. 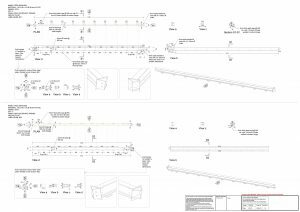 A detailed roof beam setting out drawing to enable the accurate positioning of roof steels. A detail drawing showing the interface between SIPs and steel members. An example of a steel fabrication drawing showing two beams with connections enabling interface with the SIPs frame. 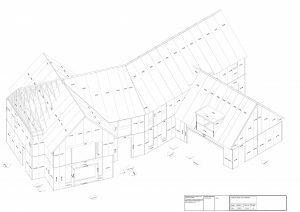 Drawing of a fully detailed 3D computer model of a house showing all of the SIPs with timber and steel structure integrated. A 2D SIPs fabrication drawing generated from the above 3D computer model showing the dimensions of the panels. 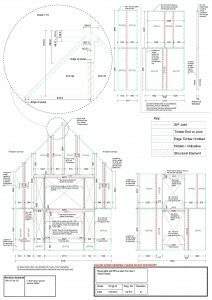 A panel assembly drawing showing the process of fitting the structure for an oriel window on a gable wall. 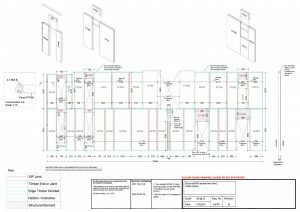 This is a setting out drawing showing the SIP walls for a house. 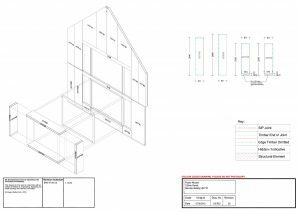 A 2D SIPs fabrication drawing of a house wall generated from the master 3D model. It shows all of the panels’ dimensions and edge cuts.